Hawthorne Berry or Shan Zha is an herb that is extremely popular is both Traditional Chinese Medicine and Western Medicine alike. In Chinese Medicine we use this herb to alleviate food stagnation by assisting in digesting meats and greasy foods and to nourish the heart and improve circulation. In Western Medicine hawthorne berry is used to lower blood pressure, lower cholesterol and help maintain a healthy weight. Since the most gluttonous of all holidays is quickly approaching (Thanksgiving) I thought it would be a great herb to focus on this month. It was Thanksgiving 23 years ago that I decided to go vegetarian, and then subsequently vegan and more recently gluten free. When I was 12 I had my first pet, Buddy, a parakeet. This little bird really made me think twice about the turkey focused holiday and I decided I could not eat my beloved Buddy’s relative the turkey. So I am thankful for Buddy for laying the groundwork for many positive changes that I have come to make. I am also very thankful for my amazing and supportive family. Okay now back to the topic at hand… hawthorne berries!!! Since we tend to eat lots of high fat foods during the holidays hawthorne berries are a perfect herb to help us digest our favorite holiday foods. 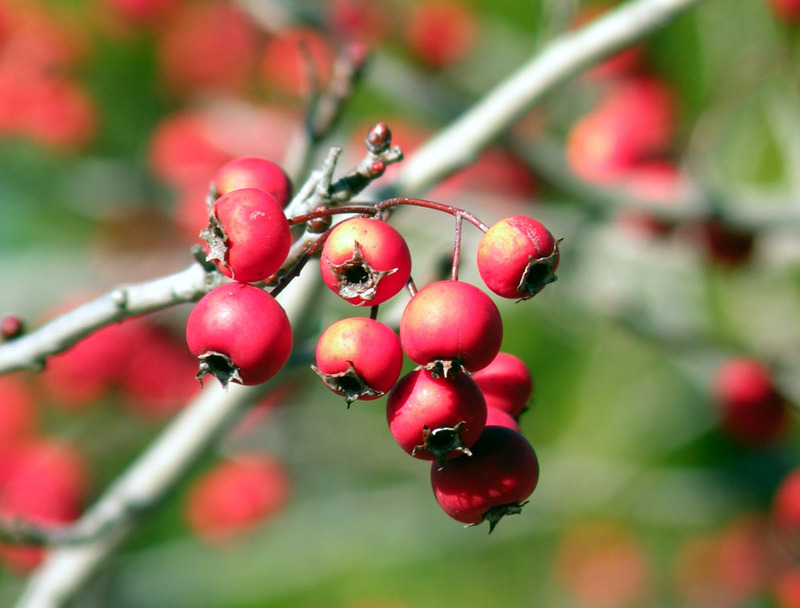 Hawthorne berries are available in tea, tincture, powdered and capsule form. Making tea is a great way to enjoy this herbal medicine and you can have it with your meals to help you digest your food. Boil water and pour over berries. Let steep covered for 8-10 minutes. Strain out the berries and enjoy! Can also add some sweetener and or lemon juice to taste. A sprinkle of cinnamon is good too. Bao He Wan- Contains hawthorne and other herbs like Shen Qu* (fermented massa) to digest all types of foods. *Shen Qu is a fermented product, but sometimes contains gluten. Here is a great blog for more fun things to do with Hawthorne Berry. Have fun!